The science behind LCPRO, Low Level Laser Therapy (LLLT) is the latest innovation in hair thinning treatments, with proven efficacy, that yields dramatic results non-surgically. LCPRO utilizes the most revolutionary technology which promotes hair growth and treats hair thinning without surgery or drugs. 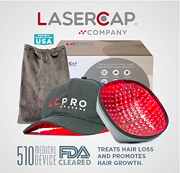 Available exclusively through select hair restoration physicians such as Dr. Alan J. Bauman, the LaserCap LCPRO uses advanced laser-therapy science to treat hair loss. This FDA-cleared medical device has 224 cool laser diodes built inside a hat for full and uniform scalp coverage. The best part? It is incredibly easy to use. Patients wear it under any favorite hat three times a week for 30 minutes for effective treatment. Celebrity hair restoration expert Dr. Alan Bauman, who has been featured in numerous TV news and media publications including The Today Show, CNN, Good Morning America and others, is a primary endorser of LCPRO. “LaserCap Company has provided our patients with thousands of superior quality devices and backed it up with exceptional customer support and patient education tools. The results and reliability of LCPRO speaks for itself time and again – I can’t imagine my practice without it. In an industry plagued by products that over-promise and under-deliver, receiving FDA Clearance underscores the safety and efficacy of LCPRO, renewing faith and confidence among the more than 80 million adults who are plagued with hair loss and are searching for a safe, proven, and effective treatment option. Today more than ever, patient and physician education is key. Diane from New York, who has suffered with hair loss for years, wholeheartedly agrees. “There is no help out there, in terms of a woman’s family doctor or gynecologist. I was forced to do my hair loss research on my own, while completely in the dark. Doctors need to be educated on LLLT, particularly primary physicians and gynecologists who treat menopausal women. LCPRO is available exclusively through top plastic surgeons and hair restoration physicians only. To locate an LCPRO physician near you visit: http://lasercap.com/find-a-doctor/.